are you enjoying the weekend? We are having fabulous weather today and even though I was working almost all day today I am determined to enjoy the rest of my weekend to the max! In this post I will share my Austrian beauty haul as I like to call it. I managed to get my hands on brands we do not have here like Catrice and S-he and fulfill quite a few lemmings in the process. I am warning you, this is going to be one looooooong post! Here is a break down of the items. 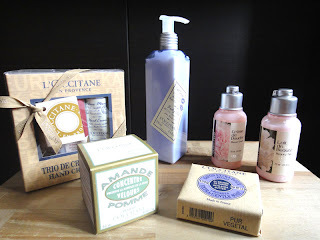 I will start with L'Occitane, which is one of my favourite brands as of late. I am always very pleased with their products and I want to slowly try the whole range. I got a hand cream pack, a lavender body lotion and soap and my favourite face cream with apple and almond extracts (works wonders on my face). It was a pleasant surprise when I was given a Pivoine Flora shower cream and Paeonia beauty milk as a present. I haven't tried them yet but hey both smell fantastic! I of course had to pop by a Claire's, as it is always one of my favourite places to shop and we don't have one in my city yet! 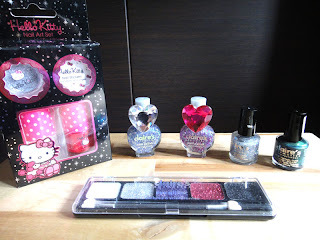 I got a Hello Kitty nail art set, consisting of two nail polishes, some nail stickers and a glitter, 4 nail polishes (3 glitters and a duochrome) and a glitter eye palette. I am an absolute glitter addict and not afraid to say it hehehe! Next up is Essence. 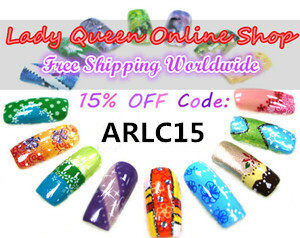 We do have this brand here too but unfortunately we seldom get any of the nail art goods or special collections so I had to stock up. On the above picture, from left to right, I have gathered some special effect toppers (Mystic Mermaid, Hello Holo, It's Purplicious, Circus Confetti), 3 glitters from the Nail Art Twins series (Blair, Edward, Troy) and a Top Coat that claims it's better than gel nails. The rest of the nail polishes, from left to right, are I Like, Bloom-A-Loom, Forget me Not from the blossom series, three stampy polishes in black, silver and white, the much coveted duochromes Where's the Party? and Out of My Mind, three magnetic polishes (Mystic Wish!, Miracle Shine!, Hex Hex!) and Roy's Red from the Whoom! Boooom!! collection. 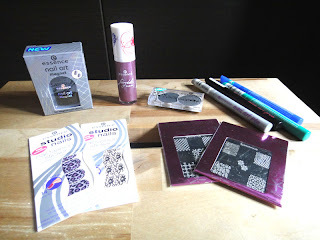 Some more nail art goods including the new stamping plates, plus an eyeshadow duo and a lipgloss. American Apparel nail polishes in Berry, Dynasty and Hassid, a Manhattan glitter top coat and a burgundy S-he nail polish with copper glitter in it. Now my problem is, which one should I try next? Where'd you get the Claire's Polishes with the rings on them? I need those (if you remember which claires store you got them, otherwise it's no problem :) ). WOW!! thats an awesome haul! cant wait to see the swatches! OMG it's huge!! i'm envy!! :D expecialli for blossom etc nail polishes!! great haul can't wait to see swatches! Τέλειο!! Ανυπομονώ να δω τα swatches που θα κάνεις!!! Καλό μήνα και Καλή Πρωτομαγιά!!! 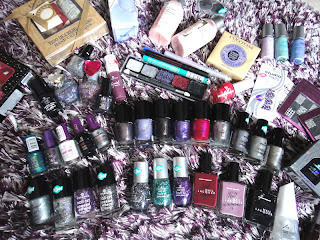 Truly amazed by your nail polish shopping ability ^^ It's an incredible gorgeous haul!!! You've managed to get all the new Catrice and Trend Editions from Essence. They look great on the bottle, I bet they look even better on your nails..can't wait to see your swatches. This is such a great haul! Amazing haul, I love every item!! Enjoy them!! I have used at least half of these beauties by now but I need to arrange the photos and make some posts with them.